Draft: 2010, Boston Red Sox, CAth rd. Full name is Bryce Everett Brentz ... Signed by Danny Watkins (Red Sox) ... Married to Anne Marie...The couple has a daughter, Everlee (born 2/13/18) ... Attended Middle Tennessee State University...In 2009, led the NCAA in AVG (.465), HR (28), and SLG (.930) as Sun Belt Player of the Year...As a junior in 2010, hit .348 with 15 HR, 49 RBI, a .440 OBP, and a .636 SLG ... Hit .366 (26-for-71) in 23 games during the 2009 Team USA season ... Graduated from South-Doyle (TN) High School in 2007 ... Selected by CLE in the 30th round of the 2007 June Draft, but did not sign. Spent the majority of the season with the Mets' Triple-A Las Vegas affiliate...Missed nearly 3 months of the season due to a fractured foot. Hit 16 HR and 16 2B in 57 minor league games, slugging .586 with a .915 OPS. Attended spring training with the Red Sox before being traded to PIT on 2/20...Was claimed off waivers by NYM on 3/26. Hit 7 HR over a span of 14 games from 4/18-5/2, batting .373/.448/.902 in that time...Began that stretch with a HR in 3 straight games from 4/18-20. Fouled a ball of his left foot on 5/6...Placed on the disabled list the next day (left foot fracture). Played 2 rehab games with the Rookie-level Gulf Coast League Mets, homering once. Returned to Las Vegas on 8/1 and hit 3 HR in his first 3 games back, including a 2-HR effort on 8/3 at Omaha. Drove in 19 runs in his final 17 games of the year. Had 4 hits on 8/11 vs. Reno, finishing the game with 4 runs scored and 6 RBI...Drove in all 6 runs in the 8th inning, with a 2-run double and a grand slam. Homered in 4 straight games from 8/17-21, part of a 6-game RBI streak from 8/17-23 (9 RBI). Following the season, played 8 games for Hermosillo in the Mexican Pacific Winter League. Spent the entire season with Triple-A Pawtucket...Named an International League mid-season and postseason All-Star...Tied for 5th among minor leaguers with a career-high 31 HR. Among Red Sox minor leaguers, ranked T-1st in HR and 2nd in RBI (85)...Led the PawSox in games (120), runs (75), hits (122), HR, RBI, SLG (.529), and OPS (.863). Became only the 7th PawSox player to hit 30+ HR in a season...His 31 HR and 85 RBI were the most by a Pawtucket player since Earl Snyder set club records in both categories in 2004 (36 HR, 104 RBI). Spent no time on the disabled list for the 1st time since he played in a career-best 127 games in 2012. Hit .299 (66-for-221) with 18 HR, a .602 SLG, and a .959 OPS in 61 games at Pawtucket's McCoy Stadium. Slugged .622 with 10 HR with RISP...Went 6-for-9 with the bases loaded, hitting 2 grand slams. Outrighted to Triple-A Pawtucket on 3/31. Hit a 2-run, walk-off HR on 4/30 vs. Gwinnett. Hit a 12th-inning, walk-off single on 5/26 vs. Durham. Named IL Player of the Week on 6/18 after hitting .500 (10-for-20, 3 HR, 10 RBI) in 6 games from 6/13-17. In June, posted a .340/.421/.740/1.161 batting line (34-for-100, 25 R, 11 HR, 27 RBI). Earned his 2nd IL Player of the Week honor on 7/2 after batting .483 (14-for-29) with 9 runs, 4 2B, 3B, 4 HR, 10 RBI, and a 1.649 OPS in 7 games from 6/26-7/2. Won the Triple-A Home Run Derby on 7/10 at Cheney Stadium in Tacoma, WA. Was the starting LF in the Triple-A All-Star Game on 7/12. After the season, hit 7 HR in 25 games for Hermosillo of the Mexican Pacific League...On 10/26 vs. Culiacan, homered in each of his first 3 AB (4-for-5, 4 R, 6 RBI). Added to the Sox' 40-man roster on 11/2. Appeared in 25 games (18 starts) with BOS, his 1st ML stint since 2014...Also hit .242 (59-for- 244) in 66 games between Double-A Portland and Triple-A Pawtucket. BOS went 11-7 in his starts, including 9-2 from 7/6 through the end of the season. Began the season on the 7-day disabled list from 4/7-21...Played in 12 games with the Sea Dogs before being promoted to Pawtucket on 5/6. Hit .295 and slugged .470 (39-for-132, 14 2B, 3 HR) in 34 games from 5/14-6/22 before being recalled by BOS on 6/24. 17 of his 18 starts with BOS were in LF...Also started at DH on 6/26 at TEX, when he hit his 1st ML homer in the 6th inning off Martin Perez. Hit safely in his first 4 games with BOS (7-for-15, 2 2B, HR)...Was 12-for-32 (.375) in his first 9 games with the Sox, but went 5-for-29 (.172) in his final 16...Optioned to Pawtucket on 8/11 and spent the remainder of the season with the PawSox. Hit a 3-run HR in his final minor league game of the season, 9/5 vs. Buffalo. Batted .333 (13-for-39) with a .930 OPS against LHP for the PawSox. Was limited to 59 games with Triple-A Pawtucket due to a fractured left thumb...Was leading the PawSox in HR (8) at the time of his season-ending injury. Split time defensively between LF (18 games, all starts) and RF (26 games, 25 starts)...Also served as a DH 15 times. Hit safely in 14 of 19 games in April, batting .297/.361/.514 (22-for-74, 9 RBI, 8 BB)...Led the team with 10 XBH in the month (7 2B, 3 HR). His 1st HR of the season came on 4/10 at Lehigh Valley off PHI's Chad Billingsley (on rehab). Hit a walk-off HR in Pawtucket's home-opening 8-7 win on 4/16 vs. Rochester. Went deep in back-to-back games, 4/27-28 vs. Syracuse. Suffered a left thumb fracture during a head-first slide at 2B on 6/17 at Charlotte and missed the remainder of the season...Was placed on the DL on 6/19 (retro to 6/18). His 8 HR at the time of the injury were leading the PawSox. After the season, played in 8 games for Caguas in the Puerto Rican Winter League. Led Triple-A Pawtucket with 17 home runs in 82 games…Had the 8th-best AB/HR ratio among International Leaguers with at least 300 AB (19.2). His 19 total homers, including a rehab stint, tied for the lead among Red Sox farmhands. Ranked 2nd on the PawSox in SLG (.475) and total bases (155). Opened the season with an 8-game hitting streak from 4/4-13 (.364, 12-for-33, 5 2B, HR, 7 RBI). Went deep in 3 straight games from 4/28-30 vs. Columbus. Had multiple hits in 4 straight games from 5/11-15…Hit .533 (8-for-15) in that stretch. Connected for a walk-off 3-run homer on 5/17 vs. Gwinnett. Had a season-high 10-game hit streak from 5/21-31, with a .318 AVG (14-for-44), a double, 3 homers, 9 RBI, and 3 walks in that stretch. Placed on 7-day DL on 7/6 with a right knee injury…Activated on 8/25 after a 6-game rehab stint with the Rookie- level GCL Red Sox in which he hit .235 (4-for-17) with 2 doubles, 2 homers, and 8 RBI. Hit 6 of his 17 homers for Pawtucket over 20 games from 6/9-7/5, immediately preceding trip to the DL…Went deep in 8/25 return vs. Scranton/Wilkes-Barre. Went 4-for-34 (.118) with 2 doubles, a homer, 2 RBI, and a walk in 8 playoff games for the PawSox…Homered and doubled in Game 1 of the Semifinals at Rochester. Following the season, played in 19 games for Escogido in the Dominican Winter League (.105, 6-for-57, 2 2B, HR, 8 RBI, 6 BB). January 10, 2019 Boston Red Sox signed free agent OF Bryce Brentz to a minor league contract and invited him to spring training. 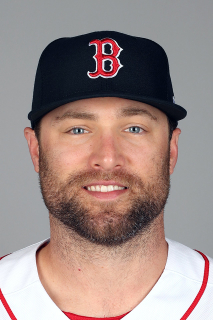 January 10, 2019 OF Bryce Brentz assigned to Pawtucket Red Sox. October 23, 2018 Naranjeros de Hermosillo placed OF Bryce Brentz on the reserve list. October 12, 2018 OF Bryce Brentz assigned to Naranjeros de Hermosillo. October 5, 2018 RF Bryce Brentz elected free agency. August 1, 2018 Bryce Brentz roster status changed by Las Vegas 51s. July 28, 2018 Las Vegas 51s sent LF Bryce Brentz on a rehab assignment to GCL Mets. May 7, 2018 Las Vegas 51s placed RF Bryce Brentz on the 7-day disabled list. March 28, 2018 New York Mets sent RF Bryce Brentz outright to Las Vegas 51s. March 26, 2018 New York Mets claimed LF Bryce Brentz off waivers from Pittsburgh Pirates. February 20, 2018 Boston Red Sox traded LF Bryce Brentz to Pittsburgh Pirates for cash. November 15, 2017 Naranjeros de Hermosillo placed OF Bryce Brentz on the reserve list. November 2, 2017 Boston Red Sox selected the contract of LF Bryce Brentz from Pawtucket Red Sox. October 25, 2017 Naranjeros de Hermosillo activated OF Bryce Brentz. October 22, 2017 Naranjeros de Hermosillo placed OF Bryce Brentz on the reserve list. October 10, 2017 OF Bryce Brentz assigned to Naranjeros de Hermosillo. March 31, 2017 Boston Red Sox sent LF Bryce Brentz outright to Pawtucket Red Sox. October 12, 2016 Boston Red Sox activated LF Bryce Brentz. October 6, 2016 Boston Red Sox reassigned LF Bryce Brentz to the minor leagues. October 3, 2016 Boston Red Sox recalled LF Bryce Brentz from Pawtucket Red Sox. August 11, 2016 Boston Red Sox optioned LF Bryce Brentz to Pawtucket Red Sox. June 24, 2016 Boston Red Sox recalled Bryce Brentz from Pawtucket Red Sox. May 6, 2016 RF Bryce Brentz assigned to Pawtucket Red Sox from Portland Sea Dogs. April 22, 2016 RF Bryce Brentz assigned to Portland Sea Dogs from Pawtucket Red Sox. March 15, 2016 Boston Red Sox optioned RF Bryce Brentz to Pawtucket Red Sox. December 14, 2015 OF Bryce Brentz assigned to Criollos de Caguas. October 5, 2015 Boston Red Sox recalled Bryce Brentz from Pawtucket Red Sox. September 28, 2015 Pawtucket Red Sox activated RF Bryce Brentz from the 7-day disabled list. June 19, 2015 Pawtucket Red Sox placed RF Bryce Brentz on the 7-day disabled list. March 26, 2015 Boston Red Sox optioned RF Bryce Brentz to Pawtucket Red Sox. September 17, 2014 Boston Red Sox recalled Bryce Brentz from Pawtucket Red Sox. August 2, 2014 Pawtucket Red Sox activated RF Bryce Brentz from the 7-day disabled list. July 31, 2014 Pawtucket Red Sox sent OF Bryce Brentz on a rehab assignment to Lowell Spinners. July 23, 2014 Pawtucket Red Sox sent RF Bryce Brentz on a rehab assignment to GCL Red Sox. July 17, 2014 Pawtucket Red Sox sent RF Bryce Brentz on a rehab assignment to GCL Red Sox. July 17, 2014 RF Bryce Brentz assigned to GCL Red Sox. March 13, 2014 Boston Red Sox optioned RF Bryce Brentz to Pawtucket Red Sox. November 20, 2013 Boston Red Sox selected the contract of Bryce Brentz from Pawtucket Red Sox. October 18, 2013 OF Bryce Brentz assigned to Leones del Escogido. August 25, 2013 Bryce Brentz roster status changed by Pawtucket Red Sox. August 17, 2013 Pawtucket Red Sox sent RF Bryce Brentz on a rehab assignment to GCL Red Sox. July 6, 2013 Pawtucket Red Sox placed RF Bryce Brentz on the 7-day disabled list. March 15, 2013 RF Bryce Brentz assigned to Boston Red Sox. August 30, 2012 RF Bryce Brentz assigned to Pawtucket Red Sox from Portland Sea Dogs. April 4, 2012 Bryce Brentz assigned to Portland Sea Dogs from Salem Red Sox. March 7, 2012 RF Bryce Brentz assigned to Boston Red Sox. June 13, 2011 Bryce Brentz roster status changed by Salem Red Sox. May 25, 2011 Salem Red Sox placed RF Bryce Brentz on the 7-day disabled list. May 21, 2011 RF Bryce Brentz assigned to Salem Red Sox from Greenville Drive. April 6, 2011 Bryce Brentz assigned to Greenville Drive from Lowell Spinners. March 25, 2011 OF Bryce Brentz assigned to Boston Red Sox. June 16, 2010 Bryce Brentz assigned to Lowell Spinners from Boston Red Sox. June 14, 2010 Boston Red Sox signed RHP Bryce Brentz.